Great suggestion from the employee there at Rockler, it did the job. Thank you Rockler. EXCELLENT LATCH FOR A DROP DOWN DRAWER FRONT ON A COMPUTER TABLE. Used these to hold a blank kitchen cabinet panel in place. New oven didn't quite fill the hole left by previous appliance and had to make a blank panel to cover the hole (looks like a drawer but no handles). These worked perfectly...just have to be very careful when measuring. Beat the heck out of driving nails through the panel and the blank panel pops right off if I ever need it to. Seems to hold pretty solidly...my dog ran into the panel and it didn't budge. I used this on a drawer in our travel trailer. It was perfect for keeping the drawer closed while in transit. Using on a removeable panel, it provides perfect alignment when re- installing. Time will tell if it wears out from friction, but I like the way it works for my cabinet. Worked as I hoped, snug fit when closed. The adjustable connections made the repair easy. Extremely satisfied with this door catch. It in stalls esasily and works perfectly. 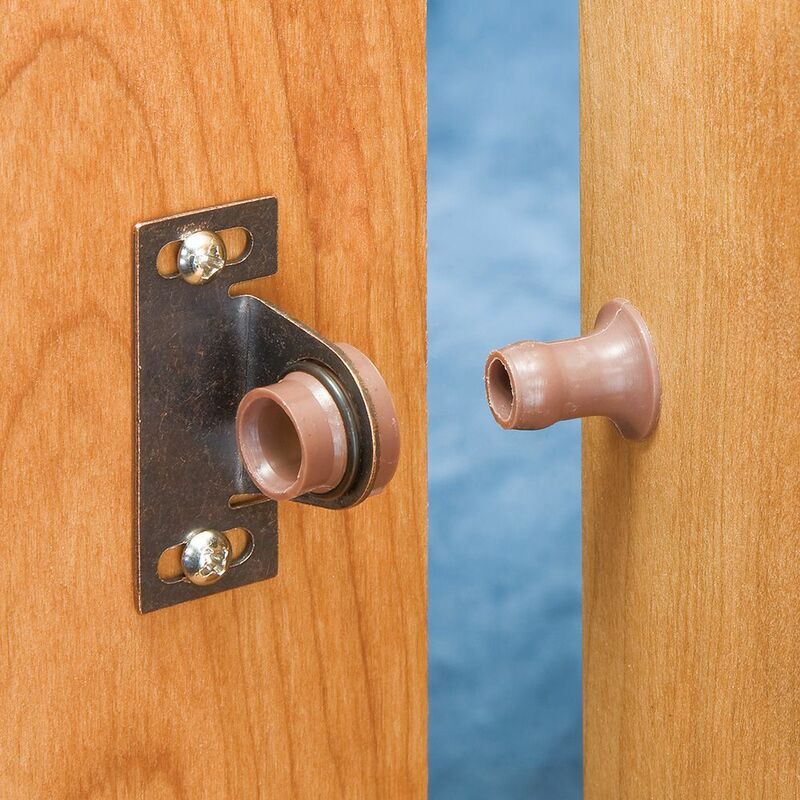 We use these friction catches on cabinet panels that need to be removed in order to have access to motor mechanisms, such as bathtub/Jacuzzi panels or kitchen hood panels. Work great! I had a condition where 2 doors on a cabinet were supposed to close because of the hinge.being a self-closer.They wouldn't stay shut. With a little bit of redesign on the doors, this was the perfect solution, one door holds the other one closed. It does what I need it to do. We have a race car trailer and I knew we were going to break a few going down the road. But I have spares and at the price and time it takes to replace the plastic circle part that fails, it makes it a lot easier. Really holds the cabinet doors tightly. The ones that have broken still held the cabinet door in place until we opened so that was good. I'm happy for this inexpensive product that you can't see from the outside. I would recommend definitely. I installed these on my kitchen cabinets to help prevent damages caused by living in California earthquake country. For the most part, these catches work pretty well for nominal quakes and have prevented my cupboards from opening. I must still excercise caution caution in opening cabinets after a quake to avoid things falling out. The only negative thing I have to say about these catches is that after repeated use, they tend to break. It seems the plastic housing held in place by a metal retaining ring on the female catch starts to crack and eventually falls out of the metal holder. But I store up on these and replace as necessary. It's a lot cheaper than buying new dishes. This hold nowhere near as well as the ones that came with the camper, despite being the same type. Disappointed. Restoring old hutch. Built in the 1920's. My wife's grandmother's. These door catches are the best and quietest! Did not use these but will keep for later. This catch looks perfect for my hidden panels on the front of my whirlpool tub. I use these blind fasteners to install access panels on tub surrounds and accent panels. Needed something to hold access panels in place for a tub surround and these fit the bill. This matches a broken one in my wife's armoire. 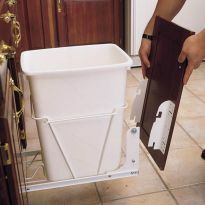 We use these to attach cabinet access panels onto the front of luxury whirlpool tub surrounds. It's a replacement for a latch that broke in a 6 year old swing-out pantry. Has anyone used these on vintage metal kitchen cabinets? I have a door that is missing the plug. The plugs on the other doors are metal so wasn't sure if these would work. BEST ANSWER: It sounds like you're referring to something like a "Youngstown kitchen". There's no way to know if this 'plug' will work with your existing catch but it's so inexpensive seems like it's worth a try. One other issue: you may need to get sheet metal screws to attach the replacement hardware - screws included in some hardware packages like this are usually designed for attachment to wood. Sheet metal screws have a different thread profile designed for attaching things to thin metal surfaces. Good luck! What is metal made of? BEST ANSWER: Some sort of steel. Not sure of the grade. So far, so good. I bought these for a race car trailer and so far with the wonderful roads we have in CA., none have fallen apart yet! But I did buy spares just in case. Metal and plastic. Its been a few so i don't remember the exact type of metal. Is this the same as a "Bulldog cabinet catch"? BEST ANSWER: Did install these, but am not familiar with the bulldog term. IMO these are only for doors that will only be used infrequently. It has a high pullout strength and will likely last a long time, but they are very loud and sometimes drag a bit taking a careful second or third push. I put one on a full size luan interior door and one of these small units did work which tells you how strong these are. Good luck on you ap. Don't know it by that name, but I used the friction catch to mount door panels on a bathtub surround and they worked great. Yes it is. I order these for one of our carpenters and he calls them "bulldog" catches.